If you're reading this article, you already know that Apple is much more than a company that creates great products. Apple is a way of life. It's an inspiration, and to some, a religion. Apple is making history by forever changing the world as we know it. But after you've read the articles and biographies and watched the movies and documentaries, you can't help but wonder about Apple's headquarters. What's it like there? And what would it be like to visit? Like Muslims who make the pilgrimage to Mecca, the true Mac faithful eventually find a way to visit the mothership, if only once. Those who visit come back with stories. What follows is my personal account. I'm in Santa Clara this week for a technical conference, and yesterday I finally had an opportunity to visit Apple's headquarters for the first time. It's been a long time coming. I've wanted to visit for as long as I can remember. But like many things in life, it just never happened for one reason or another. First I was in school, then I started working full time, and then I settled down and had a child. I had obligations. 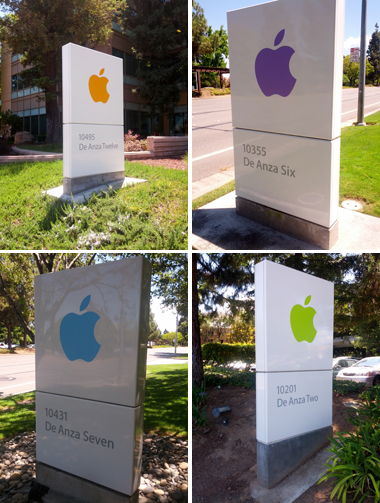 I simply couldn't justify a trip to Apple's campus, even when I went to Macworld Expo back in 2007. So visiting was a huge deal for me. This is sacred ground. Steve Jobs walked here. The Mac, iPod, iPhone, and iPad were conceived here. This is where all of the magic happens. The San Francisco Bay Area is home to more than 7 million people and practically every technology company in the world has a presence here. Frankly, I'm a little intimated to even be here. You're literally surrounded by the people who built the devices, applications, and websites you use everyday. San Francisco itself is an old city, but like much of the American Southwest, land development here in the late 20th century was not exactly planned. Technology companies such as HP, Oracle, and Apple pushed outward into Silicon Valley in search of cheap land for their corporate campuses. As a result, everything is spread out in a mess of suburban sprawl. 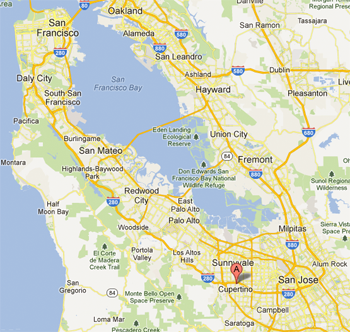 Apple's campus is on the southwestern edge of the valley in a city called Cupertino. It's just over 30 miles from San Francisco International Airport. You can forget about using public transportation to get here. It would take you over 2 hours from the airport by bus and train, so plan to rent a car if you visit. 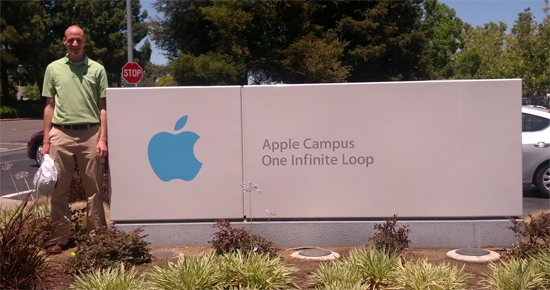 Point your GPS at "1 Infinite Loop," which is the cheeky address of Apple's headquarters. 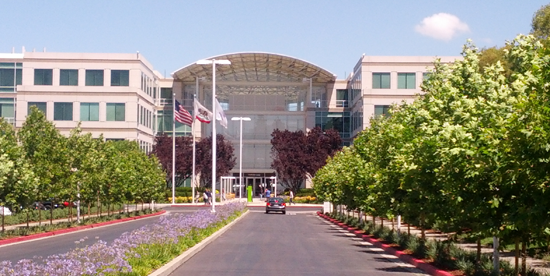 One little known fact is that Apple operates a small store at its campus. Known as The Company Store, it doesn't sell the usual hardware, software, and accessories that are available at every other Apple retail store, although those are on display here. 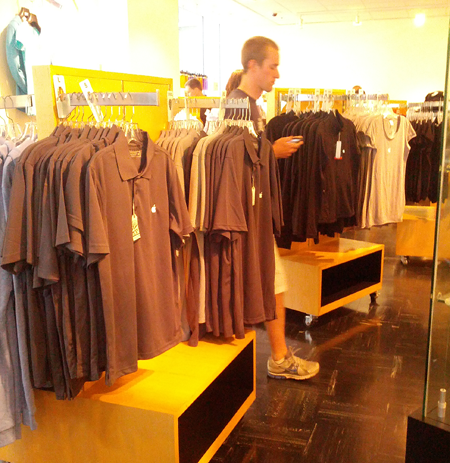 This store is all about Apple-branded clothing and accessories, and it's exclusive to this store only. The store is busy. At one point, the checkout line was 20 people deep. Unlike other Apple Retail stores, you have to wait in line to make a purchase. One supposes this is because The Company Store predates the other retail stores by 10 years or more. I don't know exactly when it opened. Bring your credit card. There's lots of cool stuff in here. Apple-branded water bottles, mugs, pens, mouse pads, hats, hoodies, t-shirts, and even clothes for kids. Of course, it's all well designed. 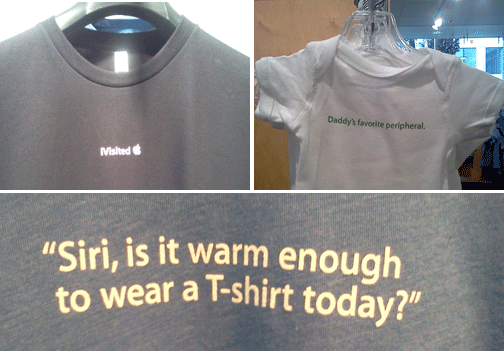 The t-shirts say stuff like "iVisited Apple" and "Siri, is it warm enough to wear a T-shirt today?" A onesie for infants says, "Daddy's favorite peripheral." It's all fairly expensive, as you might imagine. But hey, you might only visit this store once, right? 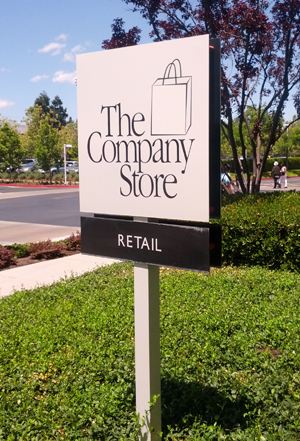 Unless you're an Apple employee, or you have an appointment with somebody who works on campus, The Company Store is probably about as far as you'll get. Apple's campus is closed to the general public. They don't give tours, and you can't walk past the front desk. You can, however, walk down the street and just get a general feel for things. 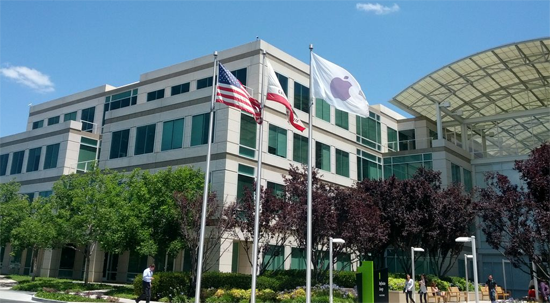 As Apple grew, it leased additional office space. As a result, the various offices are scattered down the street. Apple employees were walking between buildings carrying MacBooks and unmarked white boxes with handles - about the size of an iMac box. Could it be a new product? Something else? Who knows. In the end, my visit created more questions than it did answers. 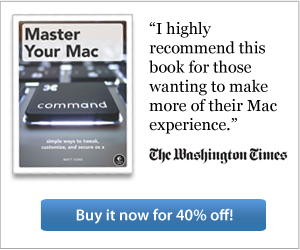 What's it like to work at Apple's corporate campus? Who are the thousands of employees that create the products we love? I saw a couple of them. They look like normal people. And judging by the cars parked at the office and the houses down the street - most of them live relatively modest lives. In other words, Apple's corporate employees are just ordinary people like you and me. The magic happens behind the scenes, which leaves a lot to the imagination. As most of you know, Apple is planning to build a new corporate campus in Cupertino, one that will probably be even less accessible to the general public. That, of course, will take years to build. In the meantime, you too can still make the pilgrimage to 1 Infinite Loop, where Apple's storied history will continue to exist for the foreseeable future.